…this is sooooooooooo for you. Why is it simple? Because there are no long rise times and your dough hook is going to do all the work while you read a magazine. I did. Even if you have never made bread, you will not screw this up. 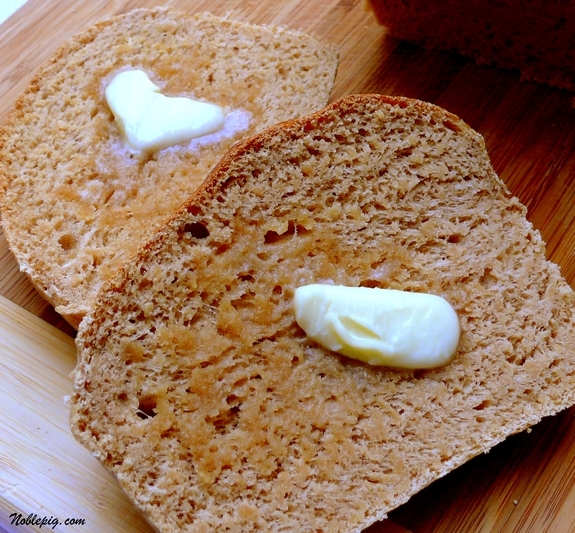 I saw this recipe for Honey Whole Wheat Bread over at Baking and Boys and was impressed at how easy it looked. Katrina used whole wheat flour while I used white whole wheat flour. Either way, it’s way better than store bought sandwich bread. What I like most, if I use all the bread at breakfast time, I can make up a batch to be ready for lunch. It’s that easy and quick. So give it a try, you will love it. In the bowl of your stand mixer combine 3 cups white whole wheat or whole wheat flour, 2 packages of yeast (I used active dry) and 1 Tablespoon vital wheat gluten. Add 2-1/2 cups of warm water (not hotter than body temperature) and mix until combined. Let stand 10 minutes. In a small bowl combine 1/3 cup canola oil, 1/3 cup honey, 1-1/2 Tablespoons lemon juice and 1 Tablespoon table salt. Add the oil-honey mixture to the flour mixture and mix untl combined. Add in the additional 3-1/2-4 cups flour (this means, start with 3-1/2 and if it’s too wet add more) and mix. Knead the dough for 10 minutes with the dough hook. When it’s done divide the dough evenly into two loaves. 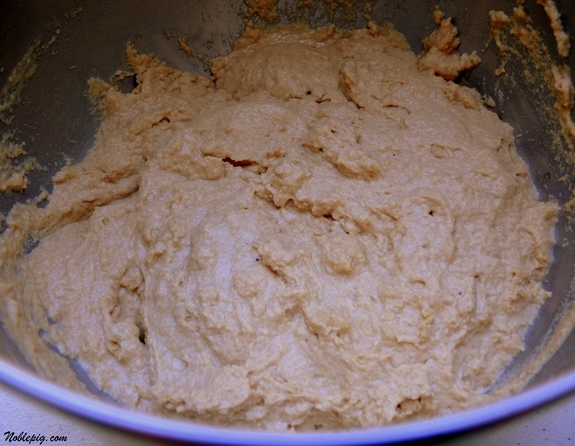 Place the dough into two loaf pans that have been sprayed with cooking spray. Cover with a clean dish towel and let rise for 30 minutes. Brush with an egg white before placing in a 350 degree oven for 30 minutes. In the bowl of your stand mixer combine 3 cups whole wheat white or whole wheat flour, yeast (I used active dry) and vital wheat gluten. Add water (not hotter than body temperature) and mix until combined. Let stand 10 minutes. In a small bowl combine canola oil, honey, lemon juice and salt. 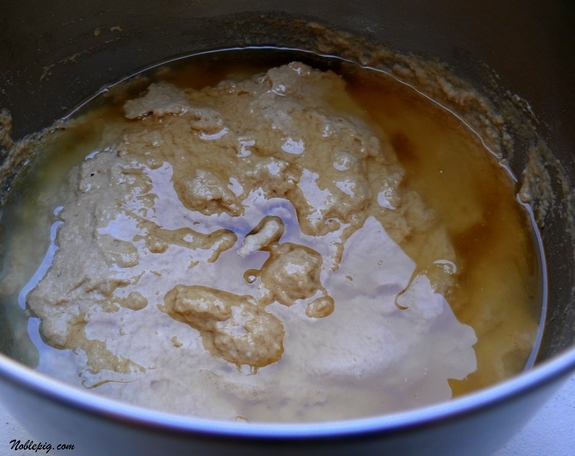 Add the oil-honey mixture to the flour mixture and mix untl combined. Add in the additional 3-1/2-4 cups flour (this means, start with 3-1/2 and if it's too wet add more) and mix. Knead the dough for 10 minutes with the dough hook. When it's done divide the dough evenly into two loaves. 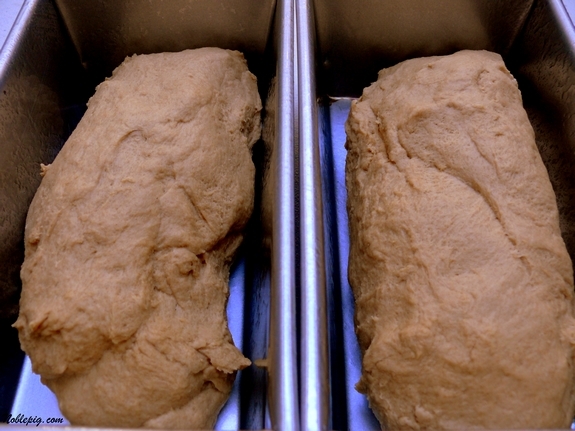 Place the dough into two loaf pans that have been sprayed with cooking spray. Cover with a clean dish towel and let rise for 30 minutes. Brush with an egg white before placing in a 350 degree oven for 30 minutes. Cool on a wire rack. Smells delicious – even over here .. and it’s breakfast time, I could make some for lunch .. bliss ..
Honey, that’s a good bread!!! Looks yummy and it appeals to the impatient child in me. I hate waiting for bread to rise. I take one loaf, please. Wow – this does look easy. I might have to try this today with my girls! Looks like a fun and yummy way to stay out of the heat! I am such a sucker for a yummy bread! OK ..on my list to try. Simplicity is one of my many middle names. Looks terrific! how funny, I just made this yesterday! I got the recipe from maria’s Two Peas and Their Pod, but it’s so popular it’s popping up everywhere! I agree it’s totally delicious, but I didn’t see the brush with egg first, so mine aren’t shiny like yours 😛 Mine also didn’t rise as much as yours, but my yeast was fine. Who knows, I know it was delcious and you’re right, EASY! I’ve never made bread before, but mmmmmm that looks tasty – I might have to try it. Yay! Looks great. I’m going to go make some more right now, if I don’t we’re out of bread and the boys won’t have their beloved pb/j sammies for lunch! All the credit for this one goes to Maria at Two Peas (and the friend’s who gave her their recipe). Nothing beats simple and tasty! I will be trying this one this coming week. That looks great! I have yet to use the kneading function on my Kitchen Aid–I want to try it! Wow, this sounds easy and it looks great! Wow, I usually won’t even try homemade bread because I don’t have the time or skills but this looks like one I can do! I have been in the mood for baking break lately. This might be the recipe that makes me actually bake some! There’s not much better than a slice of warm bread smothered in butter. What little baking I do, I’ve managed to do with a hand mixer. I’ve never owned a nice mixer, therefore don’t have a dough hook. Maybe some day! I gave up trying to make bread years ago because they always turned out like lead bricks, so I look forward to trying this recipe. Mr. Snooty will faint if it turns out right! Sounds good to me. Sometimes we need a recipe that do the work for us. 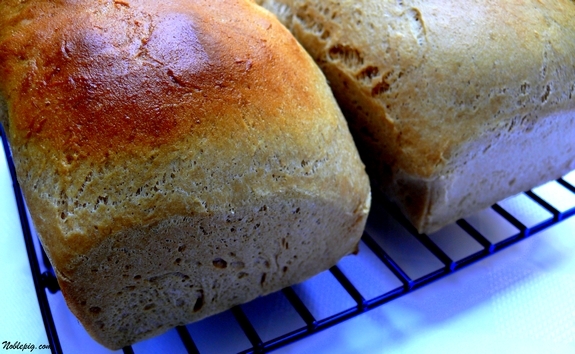 I make honey whole wheat all the time….â™¥ â™¥ â™¥ it…..homemade bread is the very BEST smell ever….I wish we could bottle that smell….love this recipe….YOU’RE DA BOMB BABY! I must try this! Thanks for posting this easy, delicious looking recipe! This is so, so easy. I can do this! Thank you. I really need to start making my own bread – you make it look so easy! And I have a weakness for breads. Holy cow woman! That looks amazing!! yummy! I am dying to try my hand at homemade bread! I use my bread maker to mix almost all of my bread doughs. 4 cups of flour makes 2 nice 8″x4″ bread loaves. I use the white whole wheat, too, because my older sons are less likely to look at it and bellow “Eeewwww!”. I’m making 3 new kinds of bread this week/weekend/next week, and will post them if they turn out well. Wowee. That is simple. The wholewheat bread I use to make had proofing plus two risings. I like this version. It’s easier and it still looks delicious. My dough hook is very underused. I need to give it some exercise! Mmmmm, fresh bread. A treat! Is “vital wheat gluten” at the regular grocery store?? I’ve never noticed it. I can only imagine all of the wonderful aromas coming from your kitchen . Nothing like homemade bread for that tounch of nostalgia. That’s some super power you have – once again I’m already making the thing you blogged about just hours before. The bread is in the oven right now. Can’t wait! I LOVE baking bread. I’m so new at it but am thrilled with my results thus far. I just bought some whole wheat flour at Bob’s Red Mill (you have to go there)and will try your recipe ASAP. It’s scary how fast I can gobble up a loaf. ummm kicking it up a notch are you? The bread looks delicious! One of these days I will have to make some homemade bread myself! Oh wow. I am going to make this. This looks so perfect and comforting for a weekend morning. love that melted butter. Must I have a dough hook? Could I do it as a work-it-off-before-I-eat-the-whole-loaf kneading workout? Yes, in the baking aisle. Nothing better than fresh baked bread – I wish more people would try it! Mmm…I can almost smell that through the computer screen! A honey bread recipe, well, being married to a bee-keeper I will have to give this recipe a try! 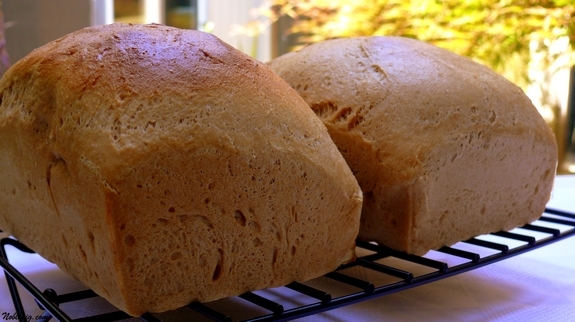 These loaves look wonderful and they certainly are easy to do. I really like this recipe. I’ll bet the boys made short order of the bread. I’m a dork. I just hit the wrong comment link. This looks perfect! I haven’t tried my hand at a sandwich bread yet. It’s on the list though. Looks awesome!!! I have just started bread making and am addicted to it. Of course I cheat and use my kitchen aid to do all the work while I pace around the kitchen and clean up. Could not live without that toy. hmmm, that bread looks really good. Your assurance that you will not screw it up almost makes me want to try it! I’m famous for making bricks… But I’m still trying to justify buying that dang kitchenaid stand mixer. I’m in love with white whole wheat flour, and with any bread recipe that can be made with minimal effort. Thanks for sharing this recipe. Looks like a great wheat bread and I like it that you said it was simple to make as bread appears to be my nemesis in the baker’s kitchen. That last line, “smother with butter” had me drooling. Granted, we don’t like honey infused breads, I might just give this one a try. Although, every time I end up trying to bake bread on my own, it ends up being an EPIC FAILURE! I can almost smell it. One of my most favorite smells is baking bread. Heaven! Thank you for this recipe! I made it tonight and it really is extremely easy. I was able to put it together in no time at all. Thanks again! looks delish! would be fab with honey butter!